Helping Pet Adoption < This Month’s PeoplePets.com Featured Pet! This Month’s PeoplePets.com Featured Pet! Adopt-a-Pet.com’s partnership with PeoplePets.com is helping to raise awareness about pet adoption! Each month a new lucky fur-kid is featured on their website, and this month it’s Miss Amanda Jones! 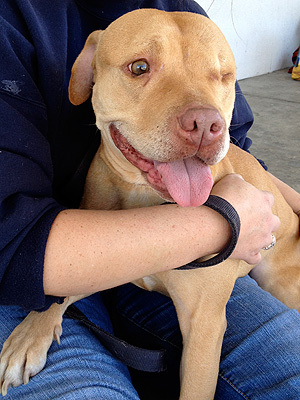 Amanda is an 8 year-old, beautiful, one-eyed Pit Bull mix in Los Angeles who is looking for her happy forever home. Although her past included some hardships, Amanda loves to dress up, go on walks, and ride in the car! She’s a fabulous pup who would make someone a very happy pet parent. Saved from a hoarding situation by Downtown Dog Rescue, Amanda has no problem getting around even though she is missing an eye. Lori Weise, owner of the rescue group says, “She climbs two flights of stairs every day up to my office like a cat!” She’s a healthy and happy dog who’d make a lovely companion for apartment dwellers as well as home owners. Thankfully, she is safe now but she’s not yet whole – what she still needs is that one friend in the world to make her family. Could it be you? For more information on Miss Amanda Jones, visit her Adopt-a-Pet.com profile!